↑ Udalski, A.; Soszynski, I.; Szymanski, M.; Kubiak, M.; Pietrzynski, G.; Wozniak, P.; Zebrun, K. (1999). "The Optical Gravitational Lensing Experiment. Cepheids in the Magellanic Clouds. IV. Catalog of Cepheids from the Large Magellanic Cloud". Acta Astronomica. 49: 223. arXiv:astro-ph/9908317. बिबकोड:1999AcA....49..223U. ↑ Soszynski, I.; Poleski, R.; Udalski, A.; Szymanski, M. K.; Kubiak, M.; Pietrzynski, G.; Wyrzykowski, L.; Szewczyk, O.; Ulaczyk, K. (2008). "The Optical Gravitational Lensing Experiment. The OGLE-III Catalog of Variable Stars. I. Classical Cepheids in the Large Magellanic Cloud". Acta Astronomica. 58: 163. arXiv:0808.2210. बिबकोड:2008AcA....58..163S. ↑ Freedman, Wendy L.; Madore, Barry F. (2010). 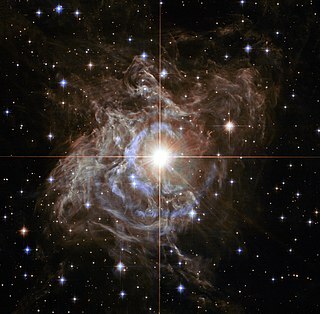 "The Hubble Constant". Annual Review of Astronomy and Astrophysics. 48: 673. arXiv:1004.1856. डीओआइ:10.1146/annurev-astro-082708-101829. बिबकोड:2010ARA&A..48..673F.